Warning: These will probably not do well on Charlie Brown sized Christmas trees! WOW! If you're looking for attractive yet blingy decorations that will make your friends and neighbors ask (with wide eyes) "Where in the world did you get those? ", then these are the ornaments for you! 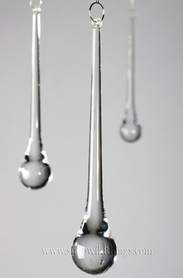 You will receive a set of 3 with the following measurements: Round: 8" tall, 5" wide, 2 1/4" deep; Square: 8" tall, 5" wide, 2 1/4" deep; Pendant: 9.5" tall, 3.5" wide (at the bottom), 2" deep. 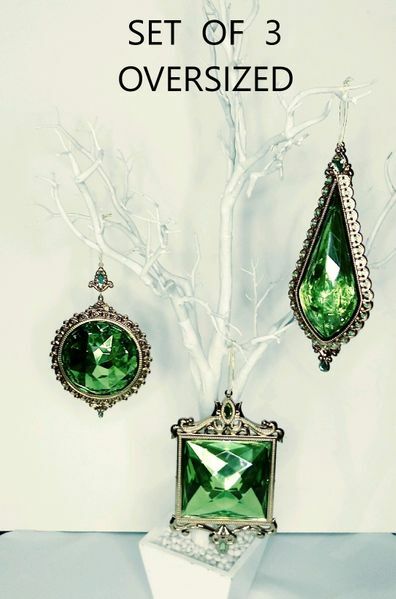 The faceted centers are a gorgeous emerald green and the ornate antique gold border on each ornament is uniquely different. Both the front and back are identical and with each decoration being at least 2" thick, these are glorious from any angle. Even the smallest bit of light makes these look like they're lit from within. Each comes with a metallic gold ribbon for instant glam and instant smiles! At only 5 oz. 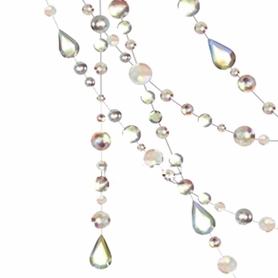 each, these lightweight gems are ideal to hang from the ceiling, in front of windows or outside; areas where you need a substantial decoration. 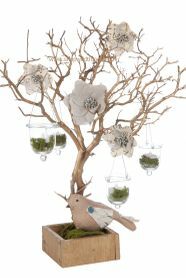 Deck out an Artificial Manzanita Tree which is a wonderful prop to decorate year 'round. Wherever you choose to hang these, they'll certainly be the pizazziest decorations around!